When most people consider car accidents, they think of causes like an improper left turn, a rear-end collision, or a crash caused by a drunk driver. However, one significant problem often not addressed is the issue of aggressive driving, or road rage. Road rage is responsible for as many as 66% of car accident fatalities, according to data put together by the National Highway Traffic Safety Administration (NHTSA) and the Auto Vantage auto club show. Read on to find out more about road rage accidents and how to get help if you or a loved one are a victim. It’s easy to see how the above behaviors might cause a serious collision. Illegal passing or running another car off the road may cause a driver to roll over, or excessive speeding or road racing can lead to a fatal collision that otherwise might not have been deadly. 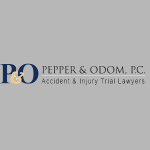 At Pepper & Odom, PC, we believe that aggressive drivers should be held responsible when their actions cause a collision that results in another person’s injury or death. If you or a loved one were the victim of a car accident caused by aggressive driving, don’t wait to contact us. Call now for a consultation to get the help you need at 601-202-1111 in Mississippi or 205-250-1107 in Alabama.